So, here we go again. Another tried and tested gastronomic treat that has made the cut and found its way onto the pages of leftwithlouie.com . 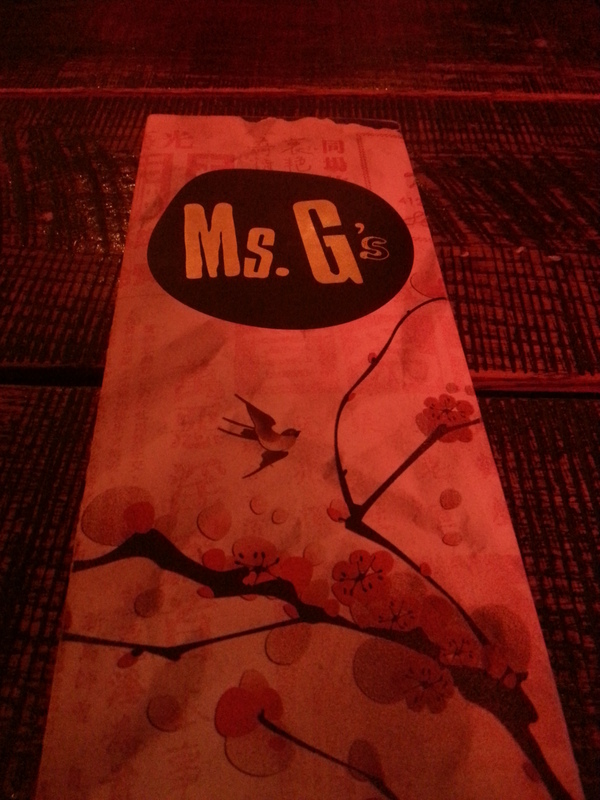 I stopped by the Sydney based, Asian-fusion mecca that is Ms. G’s over the weekend. I’ve tried once before to get a table at the busy Potts Point restaurant but had little success as they don’t accept bookings for groups under ten people and it is damn busy! This time we arrived early and by some form of divine intervention, or just pure luck managed to get the last available table. 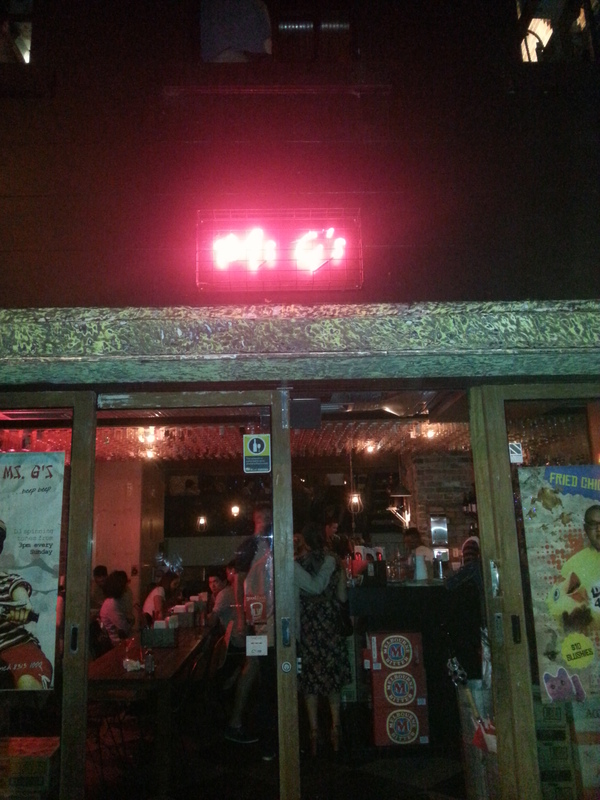 With excitement and expectation, we pored over the menu while enjoying a couple of Vietnamese beers and cocktails. A heads up on the cocktails… my sister ordered the Monkey Magic (a mix of whiskey and ginger liqueur) and nearly had her head blown off with the first sip. It took her a minute to get her breathe back, after which she recommended the rest of us order the fruity cocktails only. 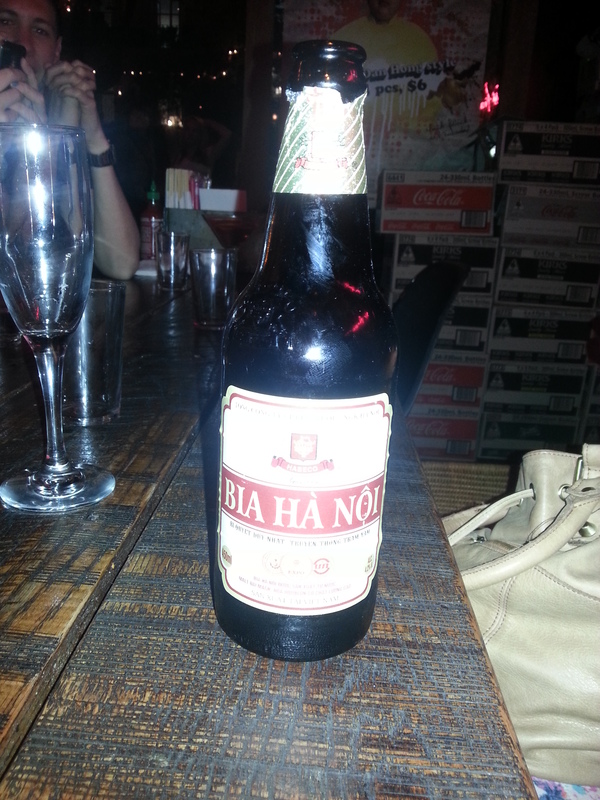 Vietnam isn’t known as a beer producing nation, but the Bia Ha Noi was a good drop. Dining at Ms. G’s is not just about filling one’s stomach; it is an experience that appeals to all of the senses. The effort that has gone into the decor is incredible. It creates an atmosphere that makes you want to push your culinary boundaries and eat everything on the menu. The staff are friendly, relaxed and more than happy to share any recommendations if they see you are struggling to make a selection from the faultless menu. 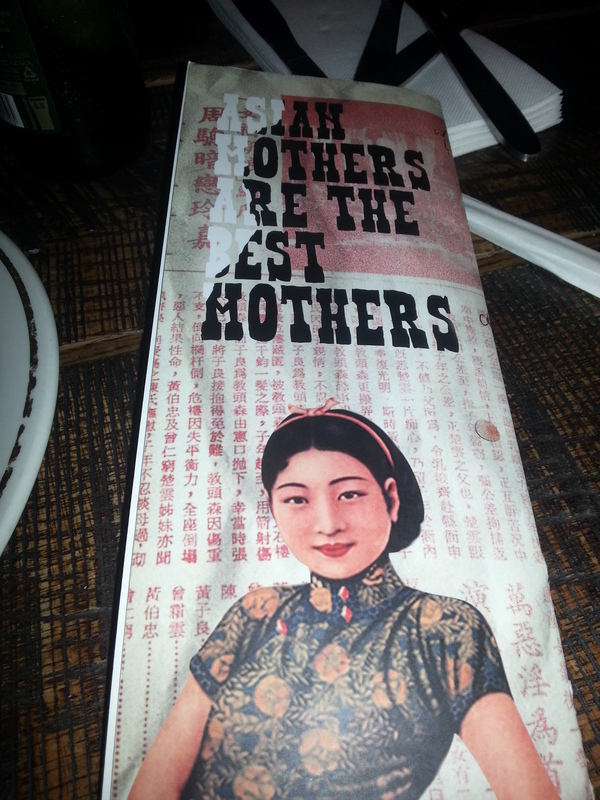 Lucky for me, I was a part of a group of seven which justified us ordering almost half the menu. The starter of Fresh Oysters in a lemongrass vinaigrette with XO sauce was sensational and turned out to be a sign of what was to come. The dishes are all designed to share and don’t come out in any particular order. This may be annoying for some people, but for me it only added to the experience. Most of the main dishes are designed for groups of about four, so make sure you order double for larger groups. 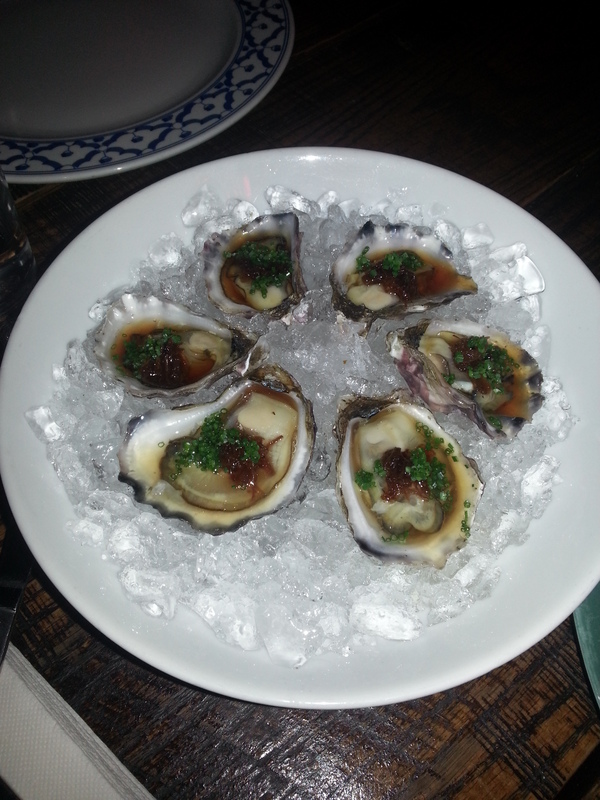 The only down side to the oysters was the fact that I only ordered half a dozen! 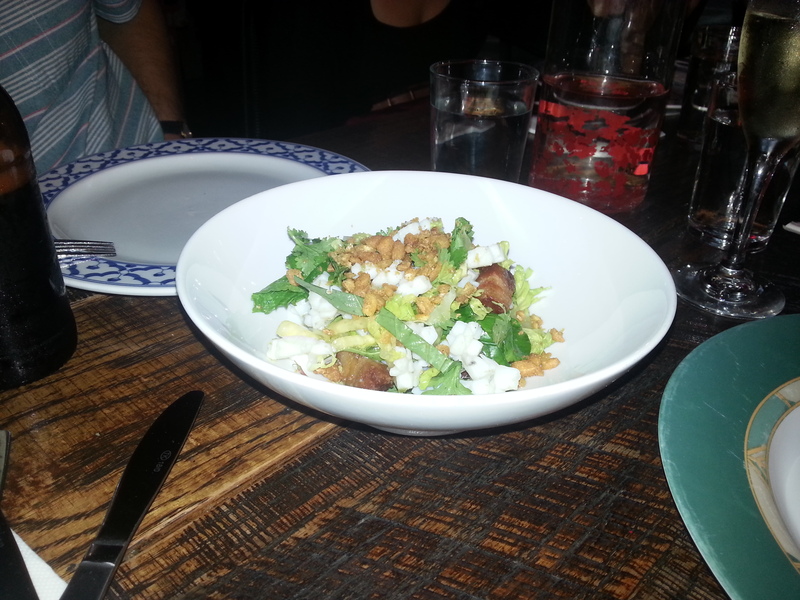 After being wowed with the oysters, next came the Crispy Pork, Calamari and Pineapple salad. The sweetness of the pineapple with the fresh mint and coriander complimented the crispy pork belly and the calamari was cooked to perfection. The stir-fried egg noodles with fried edamame and shitake mushrooms was a great accompaniment to the Vietnamese Snapper Curry. We also ordered a bowl of rice as wasting the leftover curry would have been criminal. The Pork Belly, Calamari and Pineapple salad – sweet vs. salty. Amazing. 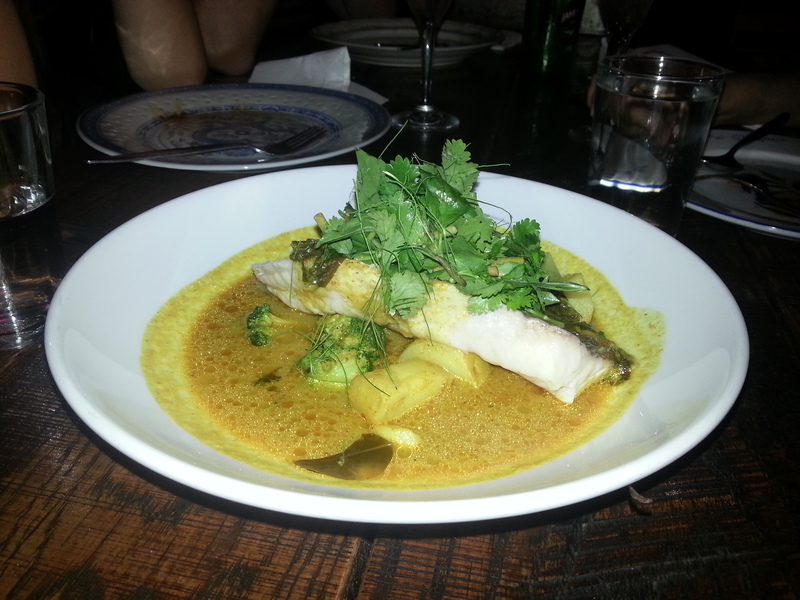 The Vietnamese Snapper Curry was the first thing on the menu to catch my eye and it didn’t disappoint. 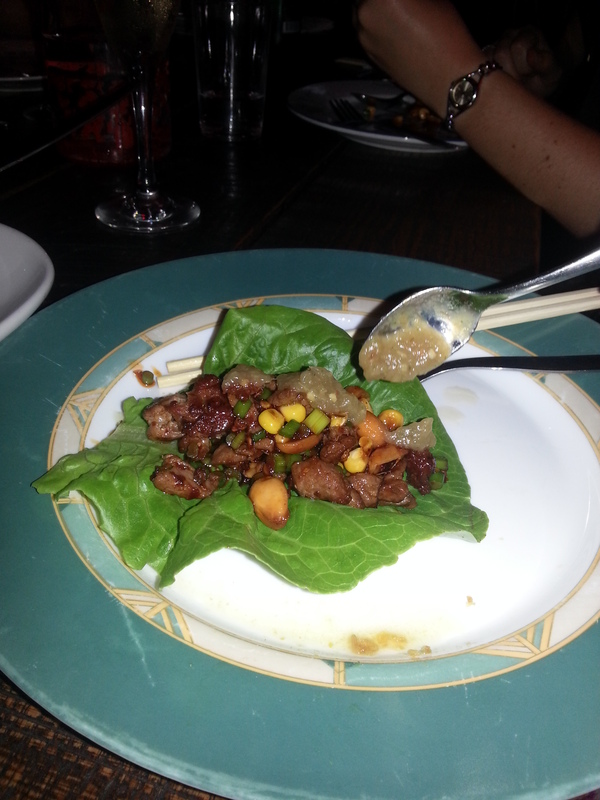 Ms. G’s San Choy Bao with Sichuan lamb and smoked eggplant sambal is hands down the best I have ever tasted. It was so good that we ordered another plate as soon as the first was finished. The lamb was melt-in-your-mouth yum and contained just enough spice to give you that burning sensation without having to reach for a napkin to pat down the forehead or watering eyes. 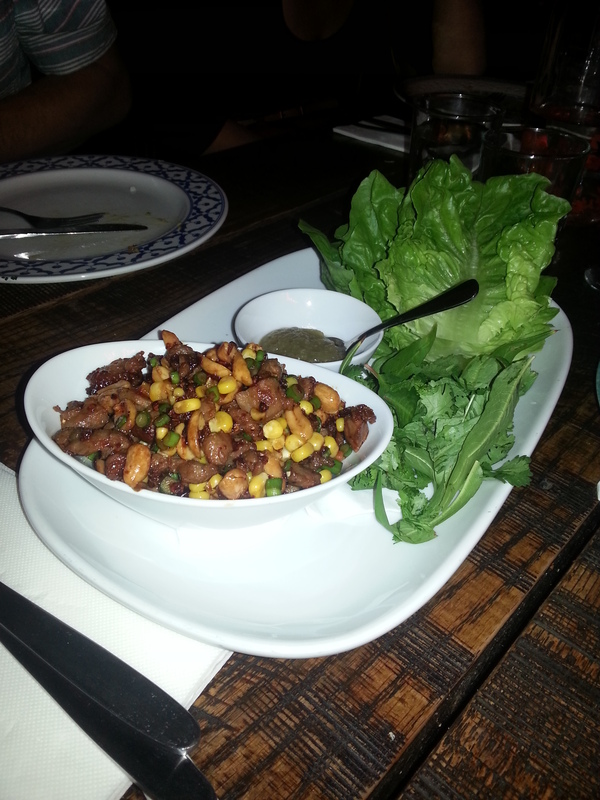 San Choy Bao (the first plate). San Choy Bao: the preparation is half the fun. Having already awarded the San Choy Bao the “best dish of the night” award, we dared not entertain the thought that Jow’s Sweet & Sour Lamb ribs or Ms. G’s Fried Chicken “Chops” 2 ways could be any better. The Fried Chicken “Chops” 2 Ways defied expectation. Half were served in a spicy Korean marinade with the rest fried and served with a Jerk mayonnaise. The contrast between these two flavours worked extremely well and summarised the idea of Asian-fusion perfectly. The lamb ribs were delightful and for me, a hands down winner. The meat, barely clinging to the bone, was slow cooked in the sweet & sour marinade for hours so that it fell apart the moment you ate it. 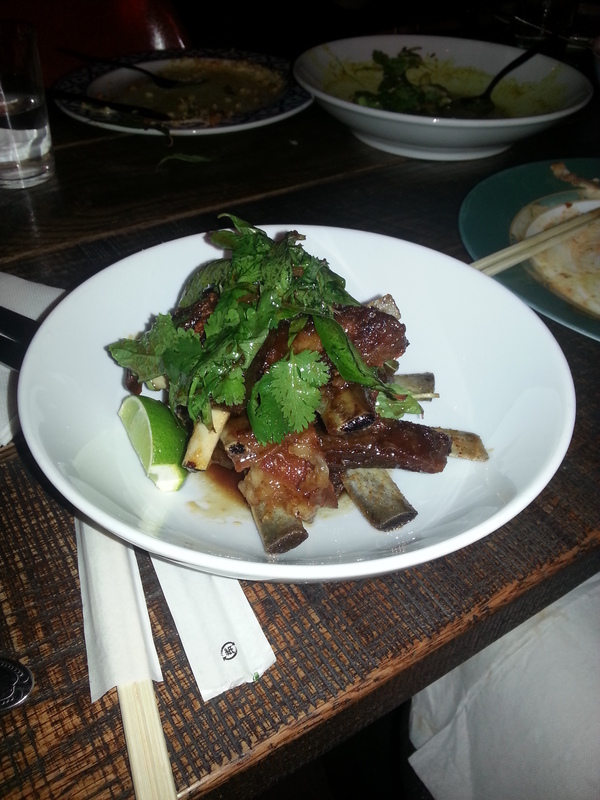 Jow’s Sweet & Sour lamb ribs in all their glory…A must if you get to visit!! After another beer (and a fruit based cocktail) the decision was made to skip desert as we were full to the point of becoming uncomfortable. The table next to us however did order a desert that I think deserves a mention. The Stoner’s Delight 2.0 contains doughnut ice-cream, peanut butter, raspberry jam, candied bacon, potato chips, a slice of Mars bar and a banana fritter. I’ll let you make your own mind up on this one, but it didn’t look as bad as it sounds. By the time we finished, the line up was out the door and beginning to make its way down the block. The next 20 minutes were spent walking the streets of Darlinghurst, raving about what we had just eaten, with everyone arguing the case for their favourite dish. 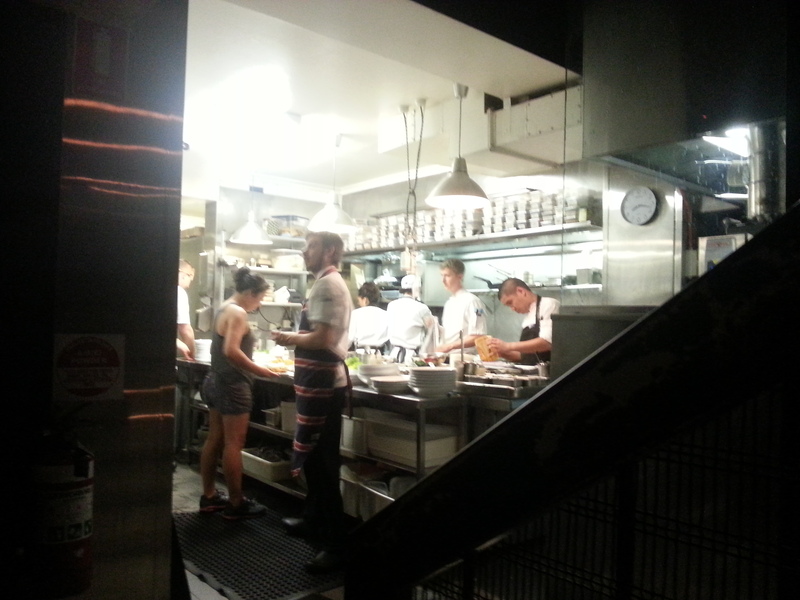 Ms. G’s has been one of Sydney’s hottest eats of recent times and continues to please the heaving crowds night in, night out. The price tag is reasonable considering the quality of the food, the staff and the experience. 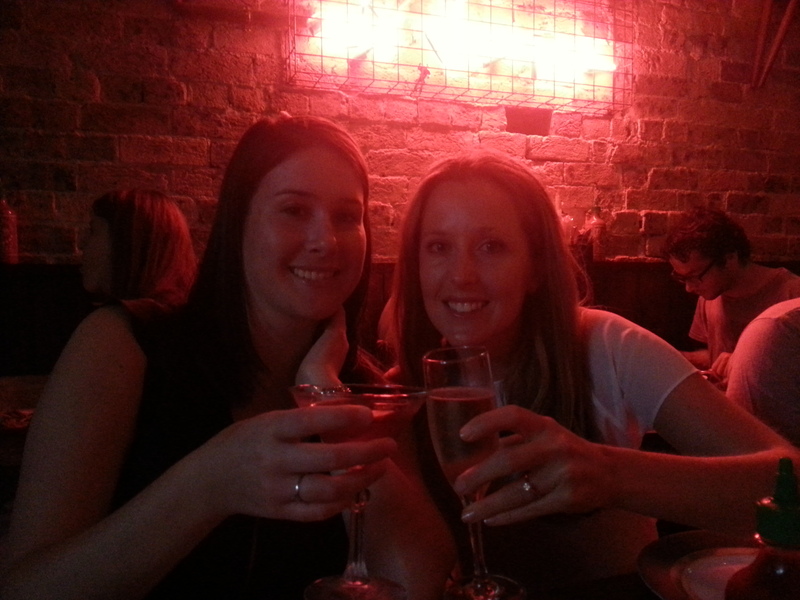 I am already flicking through the diary to find a spare weekend to head back for more! 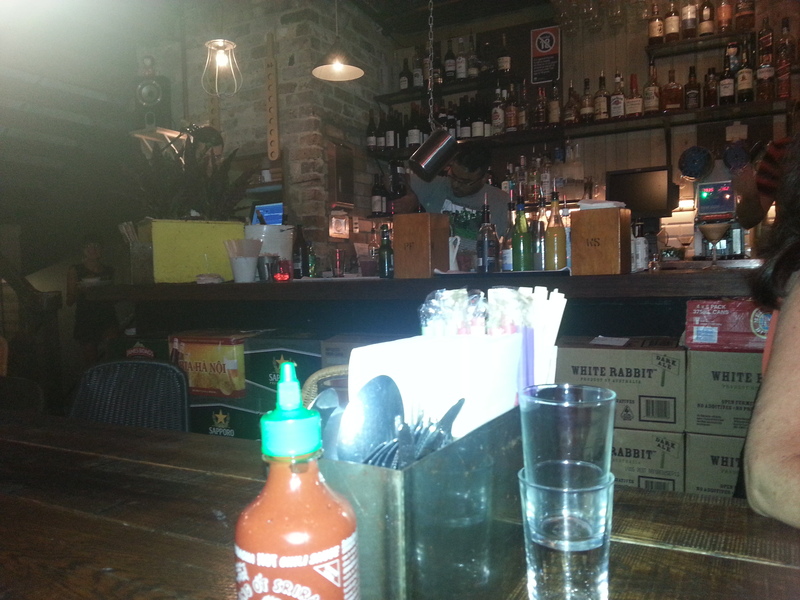 I hope this inspires you to visit Ms. G’s or to try cooking some Asian-fusion of your own. Feel free to let me know your thoughts and “Like” this post. If you enjoyed what you read, enter your email address to the right and click “Follow” for regular email updates on food and anything else that comes to mind. Ms. G’s. The simple entry to a gastronomic wonderland. 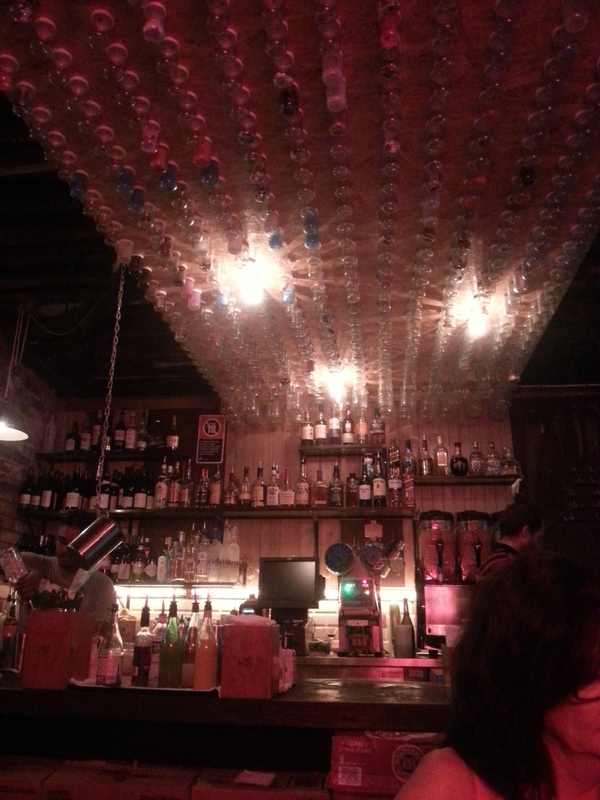 The jar-lined ceiling will keep you entertained in between dishes. The happy girls and that infamous cocktail. I liked this but still think my mum is better. I love an open kitchen! This is where the magic happens… I wonder if that is Ms. G?? Simple set up at Ms. G’s. It’s all about the food. 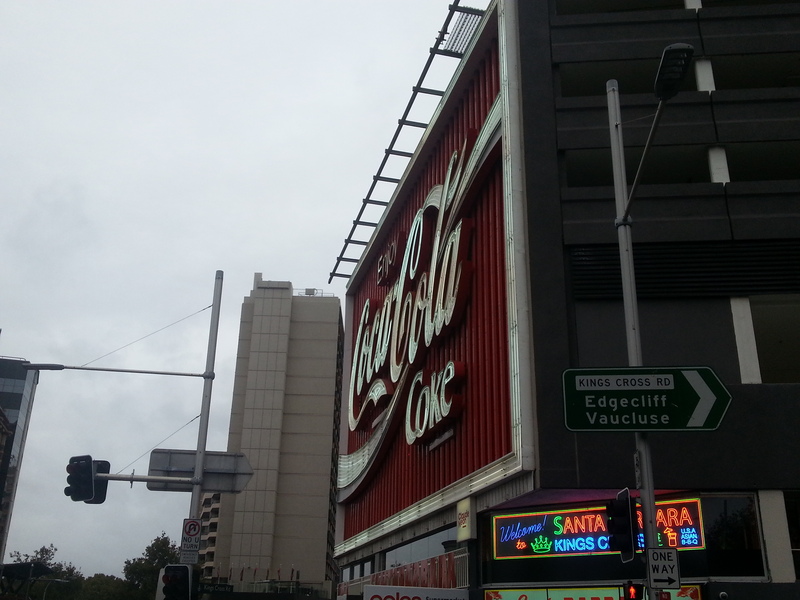 Perhaps the world’s most famous Coca-Cola sign. Wow I now want mrs g’s at 5:30AM!! !